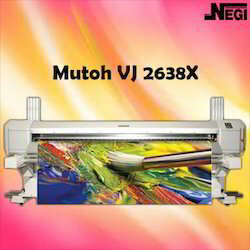 Negi Sign Systems & Supplies Co. is distributing Mutoh Eco-Solvent Printers in India since 1995. Mutoh isa Japaneseprinter manufacturing quality products for the sign industry for over 60 years. Being their Sole Distributors for India, Our product Line of ValueJet Eco-Solvent printers provide reliable production and superior print quality and added features specifically designed for the sign market. Bundled with Onyx Rip Center Software and Continuous Ink System it makes easier to run long Production Jobs. The ValueJet line also incorporates Mutoh’s patented Wave technology on all models. i² allows for increased print speeds and virtually eliminates banding, creating exceptional image quality. 1. Valuejet VJ628 (24")just 24 inches wide with Epson DX7 Print head, the VJ 628 fits into any size print shop. 2. 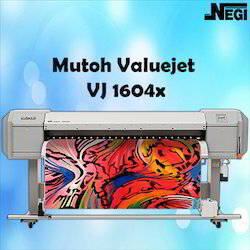 Valuejet VJ 1604 X (64") One ofThe Most Reliable Eco Solvent Printer trusted by many Clients in PAN India. 3.Valuejet VJ 1624X (64")The VJ 1624-64” Indoor Printer powered with Epson DX7 Print Head is the “Wrapper’s Choice” for speed, size and quality. 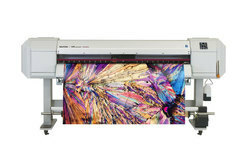 4.Valuejet VJ 1638X (64")- Dual Print Head - An innovative staggered dual-head design, the 1638X with Dual Epson DX7 head makes the most of your time. 5. 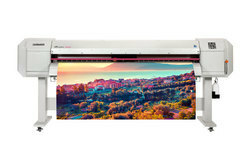 Mutoh VJ 2638X (102") - Dual Print HeadIt incorporates Dual Staggered Epson DX7 Print Heads for best Quality Printing. Mutoh ValueJet 1604X - 64 Inches Eco solvent Vinyl Printer. The compact printer made in Japan, featuring proven technology. The compact ValueJet 1604X printer (1625 mm 63.97") is ideal for Eco solvent printing. The printer is fit for both startup and established businesses wanting to extend their product portfolio. Competitively priced, VJ -1604X delivers consistent quality for volume production runs as well as short print runs. The ValueJet 1604 X is very easy to operate and maintain. Application Vinyl, Canvas, Flex, Wall Paper. The VJ-1604X is suited for the production of long term outdoor and indoor prints on a wide range of uncoated and coated substrates: posters, backlit signage, wall coverings, point-of-sale displays, fine art reproduction, vehicle graphics, stickers and much more. 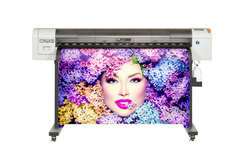 Mutoh Valuejet 1624 Eco Solvent Printer Applications such as Car Wraps, General Sign Making, Wall Graphics, Floor Graphics & Trade Show Displays can be printed on this printer. The VJ-1624 is suited for the production of long term outdoor prints on a wide range of uncoated and coated substrates: posters, backlit signage, wall coverings, point-of-sale displays, vehicle graphics, stickers and much more. 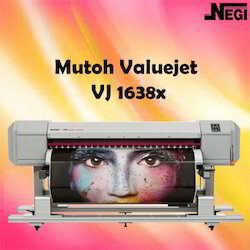 Mutoh VJ 1638X is a high speed Dual Head Printer offering Highest Print Speeds. Mutoh Ecosolvent Printer Valuejet VJ 628 is the latest Printer in the New range launched by Mutoh Industries in June 2014. 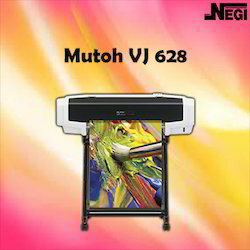 One Printer for Multiple Application is Mutoh Valuejet VJ 628 printer. Valuejet VJ 628 Printer fits comfortably in any size print shop and occupies lesser space. This ecosolvent Printer can create a vareity of applications serving as Sticker Printer,Decals Printer, Printing of Banners, Instore Graphics, Photographic Applications, Outdoor Signage, Radium Signs, Reflective Signs etc. You can also convert this to a Sublimation Printer using Dye based Inks for Sublimation on Cups, Caps, Bags and Polyester Flags. It can be easily fixed onto a table or optional Stand for your use. Bundled with Bulk Ink System you can use PZO eco solvent Ink which is economical and reliable. With Epson DX7 Print head drop size: 3.5 Pl. VJ-1628X, 8 colour eco-solvent printer is a performance printer with all the same smart features as the VJ-1624X plus it includes the MUTOH’s exclusive DropMaster print automation technique which assures the highest dot placement accuracy and eliminates the need for individual head adjustments per individual media type. The VJ-1628X is available in 9 ink colours; CMYK, Lc, Lm, Lk, white and metallic with 3 types of ink configurations; 4 colors, 7 colors or 8 colors, the possibilities for creative output are endless. Print high quality 1440dpi for photographic output or create custom wraps, banners, indoor and outdoor signs, POP displays and trade show graphics. Plus, with metallic ink you can draw attention to design details for a brighter and more eye catching image. The VJ-1628X delivers sellable production speeds up to 29m²/h at 360x720dpi. Newly developed Mutoh VJ-1938X is 1910mm/75” wide dual head sign & display printer, featuring the latest piezo inkjet head technology & high-precision mechanical design, the latest generation electronics and high quality inks. The VJ-1938X reaches the best-in-class speed and superior print quality at sellable production of 52m²/h*, and it will be a top choice for production oriented customers! The VJ-1938X printer is just the right size filled a gap between 2625mm/104” and 1625mm/64” wide eco-solvent printers, and offers you with the well-known and much appreciated ValueJet product line features and more. Mutoh Indoor Printer Valuejet-2638X (104") with Dual Staggered Epson DX7 Print Heads is suited for the production of long term outdoor prints on a wide range of uncoated and coated substrates posters, backlit signage, wall coverings, point-of-sale displays, vehicle graphics, stickers and much more.